There are businesses that are highly dependent on their services hosted online. It’s important that their servers are up and running smoothly during their business hours. Stock markets and casinos are examples of such institutions. They are businesses that deal with a huge sum of money and they expect their servers to work properly during their core business hours. Hackers may extort money by threatening to take down or block these servers during these hours. Denial of service (DoS) attack is the most common methodology used to carry out these kinds of attacks. In this post, we will get to know about DoS attacks and their various types. This article is an excerpt taken from the book, ‘Preventing Ransomware‘ written by Abhijit Mohanta, Mounir Hahad, and Kumaraguru Velmurugan. In this book, you will learn how to respond quickly to ransomware attacks to protect yourself. DoS is one of the oldest forms of cyber extortion attack. As the term indicates, distributed denial of service (DDoS) means it denies its service to a legitimate user. If a railway website is brought down, it fails to serve the people who want to book tickets. Let’s take a peek into some of the details. Specially crafted data: If specially crafted data is sent to the victim and if the victim is not set up to handle the data, there are chances that the victim may crash. This does not involve sending too much data but includes specially crafted data packets that the victim fails to handle. This can involve manipulating fields in the network protocol packets, exploiting servers, and so on. Ping of death and teardrop attacks are examples of such attacks. Flooding: Sending too much data to the victim can also slow it down. So it will spend resources on consuming the attackers’ data and fail to serve the legitimate data. This can be a DDoS attack where packets are sent to the victim by the attacker from many computers. Attacks can also use a combination of both. For example, UDP flooding and SYN flooding are examples of such attacks. There is another form of DoS attack called a DDoS attack. A DoS attack uses a single computer to carry out the attack. 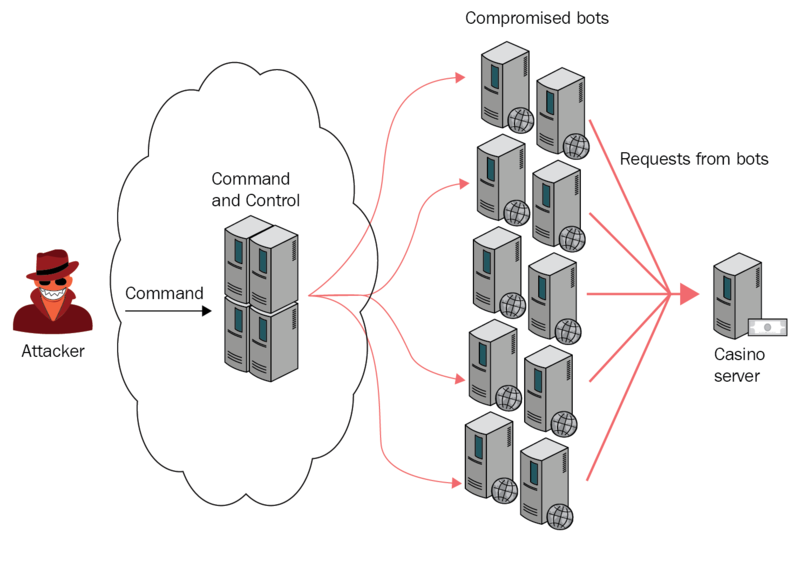 A DDoS attack uses a series of computers to carry out the attack. Sometimes the target server is flooded with so much data that it can’t handle it. Another way is to exploit the workings of internal protocols. A DDoS attack that deals with extortion is often termed a ransom DDoS. We will now talk about various types of the DoS attacks that might occur. In this type of attack, the hacker sends a specially crafted packet to the victim. To understand this, one must have knowledge of the TCP/IP protocol. In order to transmit data across networks, IP packets are broken down into smaller packets. This is called fragmentation. When the packets finally reach their destination, they are re-assembled together to get the original data. In the process of fragmentation, some fields are added to the fragmented packets so that they can be tracked at the destination while reassembling. In a teardrop attack, the attacker crafts some packets that overlap with each other. Consequently, the operating system at the destination gets confused about how to reassemble the packets and hence it crashes. User Datagram Protocol (UDP) is an unreliable packet. This means the sender of the data does not care if the receiver has received it. In UDP flooding, many UDP packets are sent to the victim at random ports. When the victim gets a packet on a port, it looks out for an application that is listening to that port. When it does not find the packet, it replies back with an Internet Control Message Protocol (ICMP) packet. ICMP packets are used to send error messages. When a lot of UDP packets are received, the victim consumes a lot of resources in replying back with ICMP packets. This can prevent the victim from responding to legitimate requests. 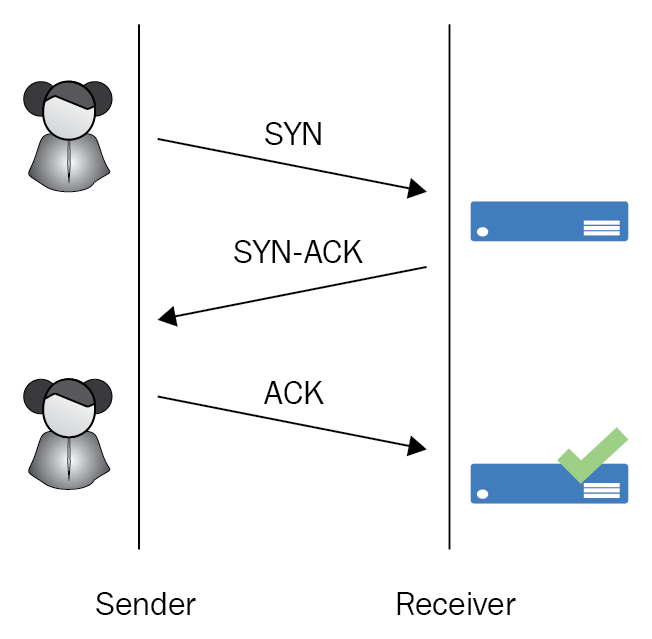 The sender starts by sending a SYN packet and the receiver replies with SYN-ACK. The sender sends back an ACK packet followed by the data. In SYN flooding, the sender is the attacker and the receiver is the victim. The attacker sends a SYN packet and the server responds with SYN-ACK. But the attacker does not reply with an ACK packet. The server expects an ACK packet from the attacker and waits for some time. The attacker sends a lot of SYN packets and the server waits for the final ACK until timeout. Hence, the server exhausts its resources waiting for ACK. This kind of attack is called SYN flooding. While transmitting data over the internet, the data is broken into smaller chunks of packets. The receiving end reassembles these broken packets together in order to derive a conclusive meaning. In a ping of death attack, the attacker sends a packet larger than 65,536 bytes, the maximum size of a packet allowed by the IP protocol. The packets are split and sent across the internet. But when the packets are reassembled at the receiving end, the operating system is clueless about how to handle these bigger packets, so it crashes. Exploits for servers can also cause DDoS vulnerability. A lot of web applications are hosted on web servers, such as Apache and Tomcat. If there is a vulnerability in these web servers, the attacker can launch an exploit against the vulnerability. The exploit need not necessarily take control, but it can crash the web server software. This can cause a DoS attack. There are easy ways for hackers to find out the web server and its version if the server has default configurations. The attacker finds out the possible vulnerabilities and exploits for that web server. If the web server is not patched, the attacker can bring it down by sending an exploit. In this kind of attack, the attacker uses a legitimate computer to launch an attack against the victim by hiding its own IP address. The usual way is the attacker sends a small packet to a legitimate machine after forging the sender of the packet to look as if it has been sent from the victim. The legitimate machine will, in turn, send the response to the victim. The reflectors are not compromised machines, unlike botnets. Reflectors are machines that respond to a particular request. It can be a DNS request or a Networking Time Protocol (NTP) request, and so on. 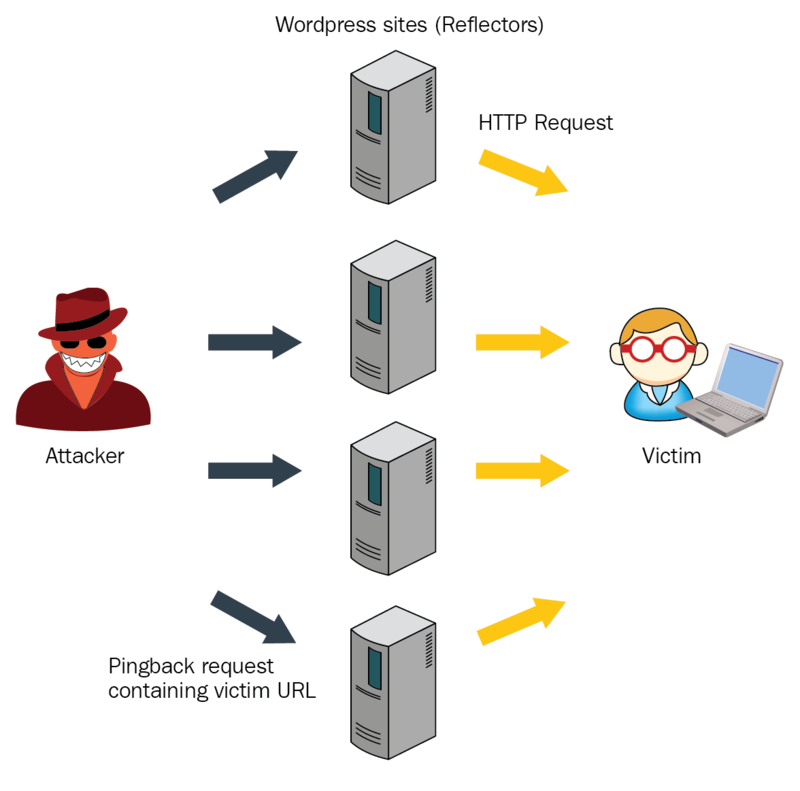 DNS amplification attacks, WordPress pingback attacks, and NTP attacks are amplification attacks. In a DNS amplification attack, the attacker sends a forged packet to the DNS server containing the IP address of the victim. The DNS server replies back to the victim instead with larger data. Other kinds of amplification attack include SMTP, SSDP, and so on. We will look at an example of such an attack in the next section. The computers that are used to send traffic to the victim are not the compromised ones and are called reflectors. 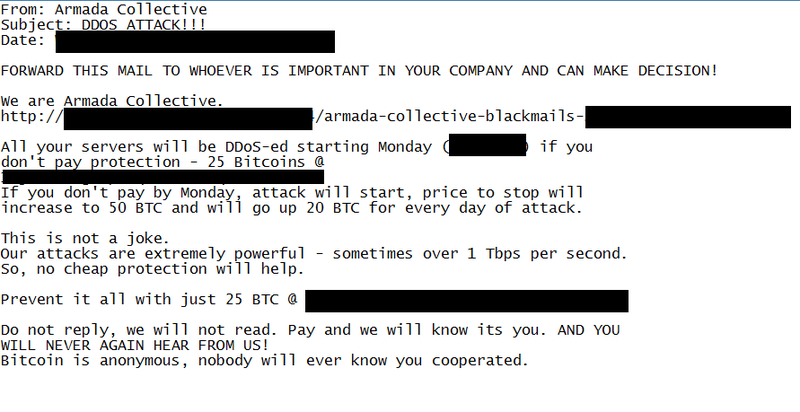 There are several groups of cyber criminals responsible for carrying out ransom DDoS attacks, such as DD4BC, Armada Collective, Fancy Bear, XMR-Squad, and Lizard Squad. These groups target enterprises. They will first send out an extortion email, followed by an attack if the victim does not pay the ransom. Usually, DD4DC are known to exploit a bug WordPress pingback vulnerability. We don’t want to get into too much detail about this bug or vulnerability. Pingback is a feature provided by WordPress through which the original author of the WordPress site or blog gets notified where his site has been linked or referenced. We can call the site which refers to the original site as the referrer and the original site as the original. If the referrer uses the original, it sends a request called a pingback request to the original which contains the URL of itself. This is a kind of notification to the original site from the referrer informing that it is linking to the original site. Now the original site downloads the referrer site as a response to the pingback request as per the protocol designed by WordPress and this action is termed as a reflection. The WordPress sites used in the attack are called reflectors. So an attacker can misuse it by creating a forged pingback request with a URL of a victim site and send it to the WordPress sites. The Armada Collective group was first seen in 2015. They attacked various financial services and web hosting sites in Russia, Switzerland, Greece, and Thailand. They again re-emerged in Central Europe in October 2017. They used to carry out a demo-DDoS attack to threaten the victim. 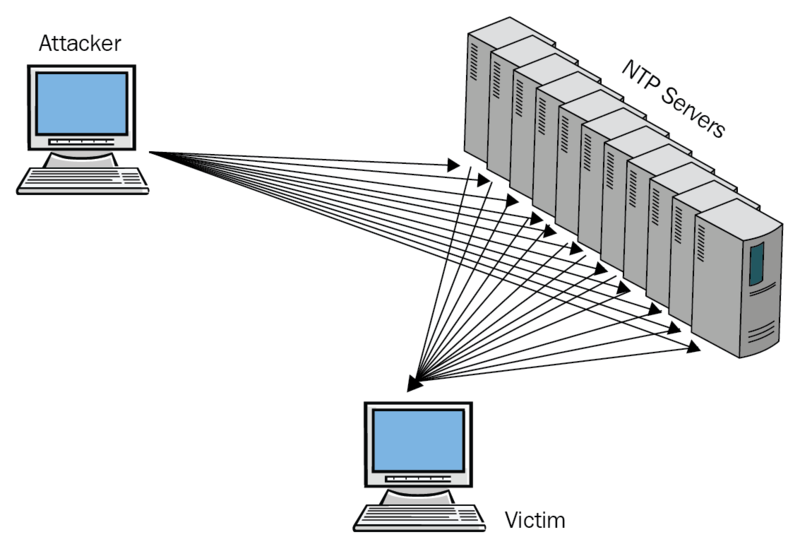 This group is known to carry out reflective DDoS attacks through NTP. The NTP protocol is a protocol that is used to synchronize computer clock times in a protocol. The NTP protocol provides a support for a monlist command for administrative purpose. When an administrator sends the monlist command to an NTP server, the server responds with a list of 600 hosts that are connected to that NTP server. We have talked about a few groups that were infamous for carrying out DoS extortion and some of the techniques used by them. We explored different types of DoS attacks and how they can occur. If you’ve enjoyed this excerpt, check out ‘Preventing Ransomware‘ to know in detail about the latest ransomware attacks involving WannaCry, Petya, and BadRabbit.